Ghana has begun building its third Floating Production Storage and Offloading (FPSO) vessel as part of moves to make the country an oil hub in West Africa. This comes after the country completed the OCTIP Sankofa gas project negotiations at a cost of 7 billion dollars endorsed by World Bank and the IFC. The FPSO construction which is expected to be completed and delivered by the last quarter of 2016 is expected to produce some 45,000 barrels of crude oil daily by 2017 and some 170 million cubic feet of gas daily by 2018. Eni and Vitol are the operators of the Sankofa fields, while the Ghana National Petroleum Corporation (GNPC) is partnering them on behalf of Ghana. The Minister of Petroleum Emmanuel Armah Kofi Buah said the upstream petroleum sector is now a major contributor to the Gross Domestic Product (GDP)becoming second to the mining sector. “The OCTP Sankofa gas project has been negotiated and concluded. 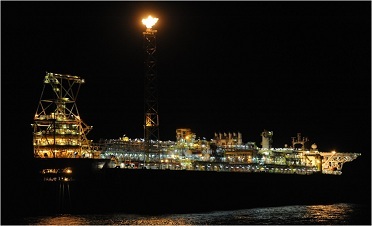 The third FPSO for Ghana is currently under construction for this project following the approval of the plan of development. I can say that the upstream oil and gas is contributing greatly to the development of this country by becoming the next major contributor to our GDP as second to mining’. The sector is one which has helped shaped our economy in times when we have challenges. This has led to the five percent growth the World Bank is projecting for the country going forward at a time when the sub region and the African continent is projected to grow at the slower pace, Minister of Petroleum Emmanuel Armah Kofi Buah said.